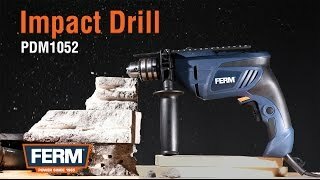 The FERM PDM1051 is a compact 550W Impact Drill with soft grip and variable speed control. The machine has a high-quality quick-action drill chuck with lock function so that the drills do not vibrate loose during use and are easy to change. The knock function in combination with the high power ensures that you can drill effortlessly and quickly. The drilling capacity in wood is 25mm, in steel 10mm and in concrete 13mm.